Also known as the Aztec Lily, Sprekelia formosissima are bulbs originating from central america, commonly referred to as the ‘Jacobean Lily’. Sometimes seen as unusual, the ‘Jacobean Lily’ has in fact been in cultivation for many years. Commonly found in older gardens and easy to grow in containers. Essentially a ‘no care’ or ‘easy care’ plant once planted they can be left for many years. These are an spring to early summer flowering bulb and add brilliant colour at this time of the year. The foliage is green and lance shaped and the plant will reach around 40 – 45cm in height. You will find bulbs for sale during dormancy at around $3 each depending on size. This particular species has been cultivated since Jacobean times, hence the name, and was widely grown as an indoor plant. Also known as the St James Lily, it is said to resemble the insignia of the ‘Knight of St James’. 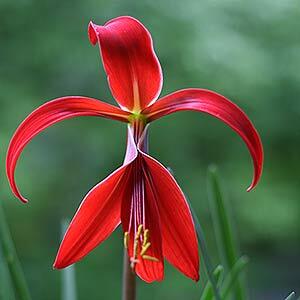 Easy to grow and with attractive red flowers, Sprekelia formosissima make a great display. Best planted in a group, as for some reason some bulbs do not seem to flower every year. They do need a cool winter and some water during the growing period to encourage flowering. A humus rich well drained soil with well rotted manure or compost dug in is best. Early in spring top dress with a little cow manure and blood and bone to promote growth. Once established these are a drought tolerant bulb. we very rarely water them in the garden, however in pots you do need to make sure that the soil does not dry to the point of desiccation. Sprekelia formosissima grow well in containers and can be planted around 6cm apart. They grow well in part shade. Plant bulbs with the neck just slightly above the ground level. In the garden give them a little more room 10 – 15 cm. Leave undisturbed for a few years, however they will become crowded and will need to divided eventually. Sprekelia glauca and Sprekelia howardii are two of the rarer species.